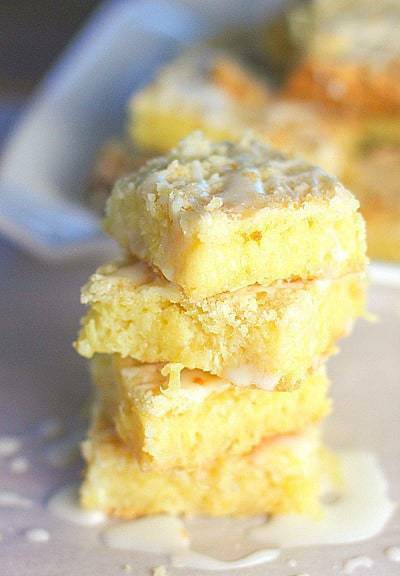 Pineapple Bars with Coconut Drizzle! A super easy to make recipe that has tons of flavor! I woke up early on a Saturday morning….like way too early! Of course Mr. Laughing Spatula was already up and out, putting gas in all the cars. You see, Mr. LS takes very good care of his girls. Every weekend he fills up our cars and washes them. Our ‘little girl’ is 24, engaged and he still takes care of her (and me for that matter). So the least I can do is make him something sweet. Right? I mean, it’s not for me? It’s simply to show my appreciation. You buying this? We have all been dieting, so there isn’t much in the house as far as goodies go, so I had to go in deep…deep into the bowels of the pantry to find something…anything! Right when I thought I’d come out empty handed, my chubby little fingers wrapped around a can of crushed pineapple! Okay! I shouted…I can do something with this!! I remembered a recipe for Blueberry Pie Bars that I posted last year. I never thought they got the attention they deserved…quite frankly the picture wasn’t one of my best. But the flavor was fantastic and why couldn’t I substitute Pineapple? 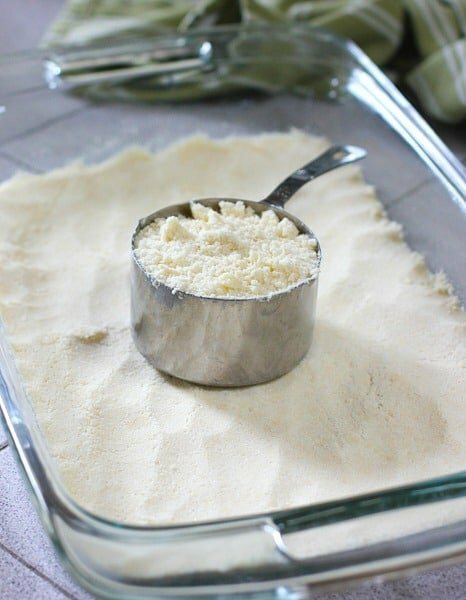 Remember to remove a cup of the crust to crumble on top of the filling! Still craving a quick and easy sweet! Try these Cherry Pie Bars! To easy to make desserts! 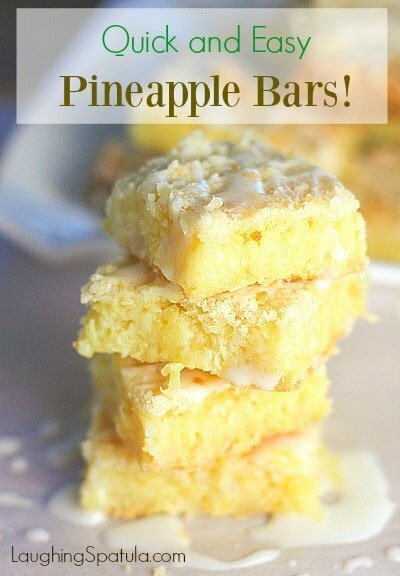 Pineapple Bars - only a few ingredients and super easy to make. 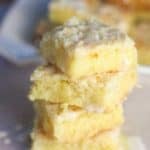 I topped with optional Coconut Drizzle...they are good with or without! Spray 9×13 glass baking dish with non stick spray. Add flour, sugar, salt and cubed butter to mixing bowl, beat until combined and crumbly. Take remaining mixture and firmly press into your baking dish, covering the bottom. Bake 15 minutes. While crust is baking- whisk eggs in a large bowl. Add sugar, sour cream, flour and salt. When crust is done, remove from oven. Pour pineapple filling onto of baked crust. Sprinkle pineapple filling with remaining crust mixture. Bake 1 hour or until top is lightly browned. Using a fork - drizzle glaze mixture over bars. I just found your recipe in Pinterest. I want to try it because it sounds delicious but I have a little problem. The ‘sticks’ of butter. I assume you’re referring to a packaging size, but living in Sweden, I have no idea of how much butter I should use. (Butter and margarine packages come in 2 dif sizes in Sweden and the wrappings are marked every 50 gr..) Could you be so kind as to tell me how much does your “butter stick” weights? Ounces will be fine, I can covert that to grams. Hi Freesia – My apologies! You are not the first to ask about the ‘stick of butter’ measurement. My old time cooking skills I guess. One stick equals 1/2 cup, 4 oz or 113g. Sorry for the trouble and I’ll update my recipe. Can coconut oil be used in place of the extract? Hi Megan – You can but you won’t get near the coconut flavor that extract will give you. I haven’t cooked with coconut oil but once or twice and am not that familiar with how it breaks down and would effect the texture. Thanks for writing, wish I could be more help! These look refreshing! I think I’ll replace the half and half with coconut milk since I don’t have coconut extract. Looking forward to trying them. Thats a great idea – let me know how it works….hoping the coconut flavor will be intense enough. Just made these. They are awesome. My husband loved. Left them in for only 45 minutes. They were getting brown. 5 Stars in my book. Will make again. I read every review when trying something new. Hope this will be helpful to someone else. Hi Mary Ann – thank you so much for your comments, I truly appreciate it! Yummy! I just made these for book club. I know that they will be a big hit. I ate three of them already. It’s pineapple and egg so it’s good for you. 😉 Thank you for sharing! Pinned and photo copied for those who will almost certainly want the recipe. Thanks for the rave reviews Lisa! My family loved them and I need to make them again soon! I just made these for a friend that loves pineapple and has cancer. I changed them up a little but I hope he loves them. I tasted them and they are delish, thanks for the recipe. Oh my – how lucky he is to have you! 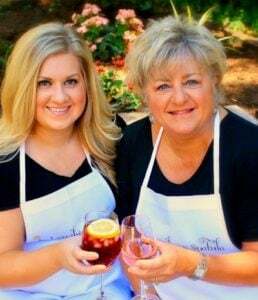 Cooking for someone you love – that’s what it’ all about. Hoping he is feeling better…. I also have cancer. I am going to make this to take to my next chemo treatment. I have the most amazing nurses an the rest of the staff is wonderful and they deserve a treat. And my chemo buddies need a treat too. I love easy to make desserts. I don’t have the energy to stand for long periods of time. So these are just up my alley. Thank you!! !